This product has been discontinued. 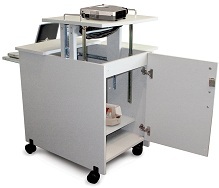 Please consider other similar Presentation Carts or Computer Work Stations like the Mobile Multi-Media Cart, Heavy Duty Presentation Station, Video Presentation Cart and more. This H. Wilson Multi-Media Cart is a deluxe presentation station, featuring tons of storage, shelves and many platforms. Features a split-top surface that allows for projector or document camera height adjustment. Features a Drop leaf side shelf for a large work surface without expanding the footprint. This computer cart has a Pull-out shelf at the perfect height for a laptop or keyboard. Locking cabinet allows room for CPU or other hardware and supplies. 3” casters, two locking. A 3-outlet electrical assembly with 15' cord and cord wrap comes standard with this AV cart. Split top surface that adjusts from 30 ¼ ” – 41 ½ ” in height to meet the needs of all multimedia presenters with cut out cable management. All doors and platforms are lockable. 12” x 18” pop up side shelf for extra work space. Includes 3-outlet UL approved electrical assembly with 15 ft. cord, and cord management wrap. Durable, easy clean laminate finish and four 3” Silent-roll casters, two with locks. Closed unit measures 30 ¼ ”H x 32 ½ ”W x 31”D. Unit Weight - 113 lbs. Compact, secure and professional. This cart has ample space to hold my entire presentation system, and keep it secured when locked. It comes flat packed, took about an hour to put together. This is a great cart! It holds everything while keeping us organized! Not to mention hiding things from sight!